Setting up a stream biotope for Corydoras. eRodent > Tropical Aquarium > Setting up a stream biotope for Corydoras. Ok so here is the latest project - setting up a stream type biotope for Corydoras. This is my second tank (third or fourth if you count the 60l quarantine and hospital tanks), so I'm well into multiple tank syndrome (MTS) here. I've had my planted 240l for nearly a year now and have picked up quite a bit of experience over that time. The plan is to set up a tank that roughly mimics the streams that Corydoras live in in the wild. I say roughly because I'm going to have some non-biotope appropriate danios in there as well. 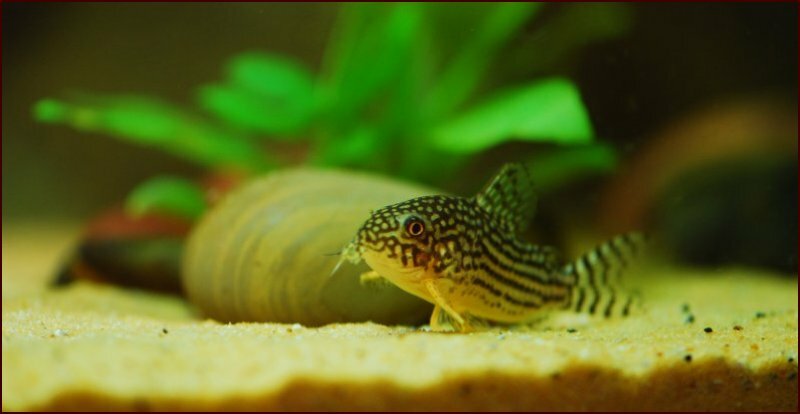 There are a number of videos of wild Corydoras on YouTube - try this one or search on 'wild Corydoras' or 'Corydoras amazon'.However the natural environment of Corydoras isn't very pretty and is quite murky so it's going to have to be a little prettier than that! Keep coming back to see how I progress. So the electrician has been and fitted a new socket where I want the tank to go. It's going in the hallway by the stairs. Thought long and hard about the location and decided on this space. It's dead space in the hall really and I will be able to see the tank when I'm sitting on the sofa watching the telly. The only potential problem is that it's near to the front door in winter so there will be a potential for drafts, but it's not in any natural sunlight or near to a radiator. So the tank has arrived and seems of reasonable quality. It has come with an Aqua One external filter which claims to be rated to 500l on the packaging (although only 300l on the website). I think it should be ok as it certainly has plenty of filter substrate area compared to the Juwel internal in my Rio 240. The top tray looks a little empty and I may buy and extra sponge for it. I've also got a 300W Aqua one heater. Have only briefly had a look at the tank and stand to check they are in one piece, but the look good enough quality. Now for the first of the choices - what colour sand do I want for substrate. I have enough of either to just about use them on their own. The dark will show up the cories better, but is a little coarse. I've shown them with the background poster. I think I'd like to do some sort of mix to make it a bit more natural looking. Either way it can't be much deeper than an inch to prevent it going aerobic. The location of the new tank. Substrate Choices. See below for a picture of the Here is the truly ridiculously large tank lurking in my hall until I get a chance to put the stand together. I also dug out some wood I had hanging around to go with a new bit that followed me home with some pebbles and cobbles. The wood's light, the stones are dark so that may also add to the choices. I'm probably not going to use the smaller bit of wood though. I discovered thatI didn't have any assembly instructions with the tank today. The shop emailed them to me, but being an impatient soul I used some I found for a similar Aqua One tank as I'm told these are re branded Aqua-one tanks. So an hour and lots of swearing later I had an assembled stand - you really need someone to help hold things to do this! I've worked out that I can't physically lift one end of the tank so my husband is going to borrow another man to lift it onto the stand. I need to carefully cut down and stick on the background poster before this can happen and I don't have the energy to do it today. Generally the tank looks great considering I paid £410 for it on a manager's special. My only quibble is that the lighting unit is not quite long enough to fit really securely on the lips of the tank (see below for an update on this). The T5s are 38W rather than 54W - but again this isn't going to be a planted tank. My 60l water change barrel also turned up today which should make the larger water changes needed for such a large tank easier - see more information about this on the Maintaining the Aquarium page. So it's together and on the stand and blooming enormous! The background poster was a bit of a game as it had to be cut exactly to size and then glued on, which results in half an hour chasing bubbles frantically while it dries. Then it was just a case of getting two men to put it onto the stand. A 300l tank is a heavy piece of kit. Played around with the sand - the dark stuff is a bit gritty but a better colour, the light stuff is very fine but a bit yellow. They actually mix quite nicely - the corys will sift and the lighter stuff will probably tend towards the bottom I know but I think it should work. Excuse the rubbish photo - tanks never look nice with no water and it's at a difficult angle - this is a very thin layer of sand at the moment as it needs washing before it goes in, the pebbles also look nice and stripy wet. There will be some plants but not until after cycling. By this point it became obvious that the lighting unit and flaps not fitting properly was going to be a problem. I called the shop and to their credit they agreed to replace them. I've also started assembling the filter. It comes with some strange little plastic balls, a blue coarse sponge, some ceramic media, a black carbon sponge, and some filter wool with room for some extra media in the top tray. After having a chat with other fish keepers I'm probably not going to use the plastic balls but will add an extra sponge and some extra ceramic media. The aquarium and some decor choices. . . . . . and the decor in the tank to test it. Ok I've had a bit of a break to get things sorted out with the lid. The shop have a new one in and apparently they come in two slightly different sizes, so it looks like I may have the wrong one. I've also bought some extra sponges and some ceramic media. The photo below shows what came with the filter and the extra stuff. I think I will lose the plastic balls and put the ceramic media that came with it and a sponge in the first basket, the new ceramisub media and a sponge in the second basket and a third sponge, the carbon sponge and floss may fit in the final basket. I'm also putting the sponges from a new Eheim Aquaball filter in there - this has been bought in case I need a hospital tank as the quarantine is in full time use. Planning to wash the sand and fill the tank over the weekend. World of Water have replaced my lid no quibbles. We think Aqua-one may have supplied the wrong one with the tank and the new one fits nicely. So I'm happy that my four hundred quid 300l tank was the cracking good buy that I originally hoped it would be - hell those filters are over £100. Gonna wash the sand and fill the tank tomorrow - promise! So the time has come to bite the bullet and actually fill the tank which I had delivered nearly two weeks ago. I didn't want to rush around this time so I waited until I actually had a full day to spend on it. First of all I had to wash the sand which was a foul job. The light stuff is fine, but the dark stuff throws out loads of black colour into the water. I did my best to get it all out but it still stained the water that I put in - hopefully the filter will be able to sort this. I've put pure dark sand at the back next to the poster which is quite dark, pure light sand at the middle of the front and a mix in between. I suspect it will slowly mix together anyhow. I have also put the stripy rocks and pebbles back in. For some reason I had a brain fade and didn't soak the wood - I think it's going to put a bit of tannins out but shouldn't be too bad and the carbon sponge should deal with it. The main problem is that it floats! But I've wedged in a rock to hold it down for now. We've got a new tank filling system - last time I stood on a stepstool with bucket after bucket of water and a jug. This time we filled up a 60l food grade barrel, put the water treatments in and pumped it into the tank with my Eheim Compact+ 3000 pump whilst continuing to fill it from the tap. So much quicker and easier. So much easier than buckets. Filter and extra medium. The filter was a little challenging to prime. It's an Aqua One CR-1200 which doesn't come with the world's best instructions. In theory you fill the filter with treated water through the hole in the top, stick the plug back in, turn on the taps and then the power and it primes. I ended up turning it on and off and jiggling it from side to side to get air locks out, but it got there in the end. It's clearing the water fairly quickly and seems pretty quiet for its size - I would say it's possibly quieter than the Juwel internal. I went for the lilly pipe in the tank as I don't want to be having to clean out a spray bar. Here are the online instructions for the Aqua One CR-1200 filter. Of course after all that I realised that I'd meant to soak the ceramic media in mature filter squeezings. I put a jug of filter squeezings into the tank instead for now and I will do it properly in the next couple of days. I have also put in the first 10ml of biomature into the tank. This is an ammonia source to fishlessly cycle the tank - if you want to know more about this read the Maturing the Aquarium (Cycling) page about my existing planted tank. Not sure how long the cycle will take this time - it took 19 days on my first tank with no mature media. Well it's a couple of days since I filled the tank - it's not cleared completely but is improving. I'm a little concerned that when the fish start moving it around it might cloud again, but we will just have to see. So it looks like I have some Nitrosomonas working in there so my cycle has started. They need to build up to handle all of the ammonia I am adding and my Nitrobacter need to build up to handle all the nitrite. I tend to do a slightly modified Biomature cycle. The current instructions state to add it until either Ammonia or Nitrite hit 5-10mmol and then wait until both hit 0 before doing a big water change and putting fish in. The old instructions used to just say to monitor the nitrite - but I think they had some really high levels of ammonia building up in people's tank. These days I monitor the ammonia and don't add it on that day if the level in the tank is 4+, but don't stop adding until the nitrite reaches 5. Later the same day: I was quite lucky to get a good bit of wood from Sweet Knowle - just wish I'd started soaking it before putting it in as I have a bad feeling it's going to take weeks to soak to sinking point. The lump of rock fell out during the day and I had to re sink it this evening. Real disadvantage of the tank is I'm right up to my armpits to retrieve anything off the bottom.vI've put a big clump of Amazon Frogbit in there now and a couple of patches of Hygrophilia as they had been taken out of my planted tank and the alternative was to bin them. So I will need to run the lights for a few hours a day and put some ferts in there I guess. The nitrite is up to 0.5 this evening (Day 2) and the ammonia had dropped to 1 before putting the biomature so it could be quite a fast cycle. I wasn't going to do a cycling diary, but it's just too tempting. However I might want more danios or maybe a small plec in there. I'm actually getting quite excited now. Interestingly I don't think my ammonia has gone down since yesterday evening - it's still reading 4 - but I do have this theory that Biomature releases the ammonia over time. Nitrite is up to 1 so something is going on. The tank has cleared a little although the water is now staining with tannins from the wood. I don't dislike this look and it softens the harshness of the background a little. The wood has also developed an interesting slime layer, bit I've heard it can do that while it soaks and hopefully it will start to sink of its own accord before long as I want my pretty rock back to arrange in the tank and I wouldn't risk putting fish in there as it tends to fall off and I don't want flat cories. I also gave the glass a good clean although I know I've got to be careful not to get grains of sand between the magnetic cleaner which would scratch the glass.This evening the ammonia had dropped to about 2 so I added another 10ml of Biomature. The nitrite is still 1 I think but I've realised the API test is pretty difficult to read over 1 - 1, 2 and 5 all look pretty similar. It may be time for a new nitrite test. Well World of Water have sorted me with some brand new lid flaps, so I have a fitting lid now and it's all very smart. The nice lad spent ages with me trying to find some reflectors to fit - they only had Juwel - so I've got just the one that is a little large but I've kinda laid it on top of the end caps and it stops the tank blinding me when I lift the front flap. Having done a little research it seems that Juwel do the 895 length I have which is a little long, and the 742 which is too short. I will have to buy the longer and cut them down. I can't really leave it resting on the end caps as I will keep knocking them off. Maybe someone else does reflectors I will do some research. My cycle seems stuck at 4ppm ammonia not going down and 1ppm Nitrite - there is good flow through the filter so I'm going to try not to fuss and be patient as it's only day 6. Danios are fine in the 60l tank anyhow. Tomorrow I'm going to add the third patch of plants and play with the scaping a bit and then go for a new photo. Still not sure about the background - might have been better to go for black. But the decision is made now due to another decision to put the tank only a couple of inches from the back wall. My bogging cycle is stalled still Ammonia 4 and Nitrite 1. I bit the bullet and took the filter apart to check it wasn't blocked although the flow seems the same - I changed the filter wool because that was very brown from the gunk the sand put off, but everything else is fine. I'm not sure I like external filters - too much water too close to the power supply. I have a new extension lead that I'm gong to fix on the inside of the cabinet up high so that it is out of any potential leaks. So I've been reduced to adding Interpet Filter start! This is one of those 'bacteria in a bottle' products that I'm very dubious about because I don't think the bacteria could survive sealed in a bottle with no food and no oxygen. Of course what I really need to add is a bit of patience as it's only day 8. The water has, however, cleared beautifully in the last couple of days which is a relief as I was wondering if it was going to stay cloudy forever. Injured my thumb and need to keep it out of the water as much as possible - so the finish of the scape will need to wait - not bothered with another photo as it looks the same, only clearer and with some catappa leaves and a distinct lack of Corydoras. Well it's day 12 of the cycle and finally the ammonia has dropped to 2 and the nitrite gone up to 2. I've added some more Biomature and Filter start to the tank. I have also planted one more patch of Hygrophilia in front of the wood. I tried taking the rock off the wood yesterday and it's still floating - grrr. Ah well - patience! I tested the ammonia today and it had gone down to 1.2 overnight so something is definitely happening now. I put some more Biomature in before I realised the Nitrite had hit the target 5 so I didn't need to. Never mind - it won't hurt. So it could have been the Filter Start or me changing the floss - but the chances are I'd just reached the point where things would have started anyway. The moonlight LEDs that I ordered off eBay turned up yesterday and it looks like they are going to look great. I'll take some more photos over the weekend with them on. Well the ammonia has gone down to 0 now, but the nitrite has got pretty high - probably about 10 from my experiments with diluting tank water. Shouldn't have added that last dose of Biomature - but I'm sure it will drop in time. Need a bit of a delay anyhow due to problems as had a bit of a disaster on the danio front - one of them had a white lump on his mouth. Most likely culprit is mouth rot or some sort of fungus. These are conditions of poor water quality. There have been no signs of ammonia/nitrite in the quarantine tank but maybe 20-25% water change a week isn't enough. After much agonising I treated with Interpet Fin Rot and Fungus No 8. To add insult to injury Practical Fish Keeping forum is down because some sod has hacked them so I couldn't use their treatment finder. The danios weren't terribly happy after the treatment - they were swimming at the surface and slowed right down. It contains phenoxyethanol which is also used as a fish sedative. I turned the venturi on the filter up to aerate the water and this morning they are swimming at all levels again, if a little slower. I'm hoping that it was caused by an injury rather than poor water conditions, or a problem with his health - it looks smaller today so hopefully it will disappear and everyone will be ok. It was also a pain because the Mahogany Trumpet Snails I'd acquired for the new tank to keep the sand aerated had to go straight in the main tank as I don't know if this medication is snail safe - and I will need to use a copper based one if it doesn't work which definitely isn't. So lord alone knows if I will ever see them again - I didn't necessarily want them in the main tank and they ought to have been quarantined, but sometimes you have to make a choice of rubbish options. Actually I know I'll see them again - millions of the little blighters no doubt - although I've never had a great snail problem as I don't overfeed and that gravel's been in there a year and could probably do with aerating. I've also fixed my moonlight LEDs to the back of the aquarium - will try to get some photos soon but am exhausted from assembling the Christmas tree. Currently suffering from PFK forum withdrawal symptoms as I have no-one to discuss my fish tank with. It's very sad and may force me to get a life!! As if the weekend of the sick Zebra Danio wasn't enough (she's starting to look a little better), it all went completely surreal today. I was doing a bit of 'scaping, moving the rocks around and cleaning up the plants, when all of a sudden I spotted something out of place. A fry! Do they not know how toxic ammonia and nitrite is? - the nitrite is still 5. To cut a long story short it's a good job I didn't use the hospital tank at the weekend. I set it up with water from the main planted tank, moved lots of frogbit, some Hygrophilia and the catappa leaves over and caught the fry and put them in a fish bag and acclimatised them very slowly over more than an hour. They're swimming around in there at the moment. They're not tiny fry - they are a cm long and have a glowy line and eyes. Must be 2-3 weeks old. I thought initially they were cardinal fry as they appear to have blue rings around their eyes - but I'm not so sure they aren't Glowlights as their glowy line looks a little red. Time will tell if they survive. Don't hold out a lot of hope for them but I've done my best - I couldn't really leave them in the toxic tank. So no photos at present - I've been too busy saving fry! The nitrate stayed high for a couple of days and then started dropping rapidly, hitting 0 on day 19, coincidentally taking exactly the same number of days to cycle as my planted tank. The tetra fry are still alive 3 days later - I've swapped some of the sponge in their filter for some fully cycled ceramic media from the cycled tank. I also bought some proper fry food for them (Nutrafin Liquifry 3) as they were struggling a little with the crushed flake I was using. In theory I would do a big water change and put the Zebra Danios in, but I am concerned that the one with possible mouth fungus isn't completely cleared up so I'm going to hold on to do another dose of treatment in the weekend as it's much easier to use treatments in a small tank. Photos soon honest, but I've got a lot on with the 4 tanks going at once. Misidentified the fry - they are Zebra Danio fry. Thing is I don't remember moving any plants from the tank with the Zebra Danio in! I certainly used some filter squeezings so there could have been some eggs lodged in the filter I guess. Ah well - less exciting than tetras, but they can go in the shoal when they grow! I still have problems with the zebra danio and have a terrible bacterial bloom outbreak in the tank at the moment. Finally got around to taking some pictures of the finished tank. I have had to put some more biomature in as I can't put the Zebra Danios in yet. One of them has still got something on its mouth that may be fungus or mouth rot. I have done a couple of big water changes to get the previous medication out and treated with a combination of eSHA 2000 and eSHA Exit and have my fingers crossed that it will work. I had a bacterial bloom break out yesterday - I'm thinking it has to be something to do with the last treatment as the ammonia and nitrite has been 0 all week and there isn't a lot of organic waste in there. The fry are still doing fine. Here are two photos of the tank under normal lights and the moonlight strip. I tested the Nitrate and it's only 5 - this may be because the fast growing plants in there are sucking it up - this is certainly what happens in my planted tank but I'm surprised that it has happened in a cycling tank because there is a lot more ammonia around to be converted to nitrate and I'd expect the levels to go up. Haven't dared take the rock off of the wood yet as it was such a pain last time I tried - this is a problem I will look at when I'm closer to adding fish - it could probably do with getting out and giving a bit of a scrub to be honest. It got a good layer of slimy bacteria on it initially, which is now dying off. Ready for fish - shame I can't move them! It's not been so good the last fortnight. The second treatment made no difference to the Zebra Danios' infection. I tried aquarium salt and Pimafix for a week or so, more to give the little fellas a rest than in any hope of it working. It's difficult to know what caused this as they had been in the tank for several weeks before there were problems so I don't think they came with it. These sorts of problems are usually stress or water quality problems, but I had been quite careful with the water quality. I think there was a certain amount of bullying going on in the small tank, which may have been the stress that triggered it off. Finally after about 5 weeks with no luck and the problem actually getting worse I made the sad decision to euthanise the danios with oil of cloves. It was a very difficult decision but most of them were showing signs and I was terrified of the infection spreading into my planted tank. It seems that once fish get sick there is little that can be done with the treatments that are available over the counter. It's quite interesting to note that most of them claim to control rather than cure the condition, which is what they were doing. The infection didn't progress rapidly, but it wasn't getting better. In the meantime I had continued to add Biomature to the new tank to keep the filter mature. After a couple of weeks got the traditional pH crash. I think what happens is the cycle bacteria use the minerals from the water that stabilise the pH - so as these get low the pH drops. This also happened when I cycled my planted tank (see the Maturing the Aquarium page). This is prevented in mature tanks with regular water changes, but when you are cycling you are using much larger amounts of ammonia than would be produced by fish and with no water changes it can happen quite quickly. I stablised the pH by adding bicarbonate of Soda until I had time to do a big water change. The other reason for a big water change post cycle is that the nitrate levels tend to go up a lot - this was reduced by having fast growing plants in there but it still needed reducing. Finally today we changed about 2/3-3/4 of the water, warmed it up and the two danio fry (now little fish) were moved in. I have also bought 4 more small Zebra Danios who are now quarantining in the hospital tank. The hospital tank (which had been set up for the danio fry) was used quarantine tank has been completely stripped down and everything is drying out well in the airing cupboard. I have thrown away the gravel, plants, wood and filter materials. The hospital tank has the same filter as the quarantine - a Eheim Powerball, which is modular, so I extended it with one of the cleaned sections from the quarantine tank using cycled ceramic filter material from the new tank.The fry look completely lost in a 300l tank, but a small shoal of danios should look good. I trimmed back the plants and removed a lot of the duckweed/frogbit at the same time as the water change. I also removed some of the sand, as it was a bit deep, and washed off the wood. It now sinks and doesn't need weighting down - it's been in 5 weeks so I don't know how long it took! Today the 4 Zebra Danios have gone into the tank, freeing the hospital tank to quarantine some more fish. The two fry that were in there already are almost as big as the new four now - they've grown really fast. After much thought I plumped for half a dozen peppered cories. These are hardy and underrated as they are really quite pretty with their peppered spots and iridescent green patches. Although the tank has been cycled it's still got some maturing to do, as has the quarantine tank filter, so I thought hardy fish were the way to go. I'm also feeling a little skint at the moment. Did fall in love with some green spotted ancistrus so it's possible one of these will be next in a couple of weeks. I've kept the quarantine tank as the hospital tank for now. There is no substrate as this makes it much easer to keep it spotlessly clean. I've also got some new filter media for the other filter and put it in the cansiter filter to mature it so that I've got a hospital tank should I need it. It's all going quite slowly with the stocking, but I now have half a dozen Sterba's cories to go with the peppered. They shoaled together to start off with but once settled the Sterba's behave a little differently, spending more time swimmming at higher levels than the peppered cories. I currently have another tiny danio fry swimming around in my quarantine tank - obviously hatched from eggs left when quarantining the new danios and survived the attendion of quarantining cories. There's also the nerites from the main planted tank in there at the moment while I do some 'scaping work in there. Haven't had a lot of luck with photos and need to spend a bit more time on it but here's one. There's also a YouTube video of the finished tank. The plan is to try to catch my peru green stripe cories from the planted tank and transfer them next. The finished tank (you need to allow ActiveX to see this). Major nightmare job today - the total trashing of the planted tank. Well not exactly, but I removed all of the planting apart from the big swords, took the big piece of planted bogwood out and removed half the water to catch my peruvian green stripe cories. Haven't seen more than a couple of the little fellas at a time in months and I thought they'd be better off in cory tank with some friends. This would allow me to stock some tetras I'd actually see in the planted tank. In the end I only found 5 of the original 6. It's possible one might have died and been eaten without me seeing the body, or he could just be really good at hiding. Every scrap of plant material has been closely examined before being thrown away or put back. The other fish in the planted tank don't seem too distressed by the experience and the filter has got the water almost clear again already. I'll leave it a week or so before I put more crypts into the empty places.